For the summer Deliveroo and me curated a picnic map of popular and insider picnic spots in Berlin. Did you know, that you can order food also in the park? 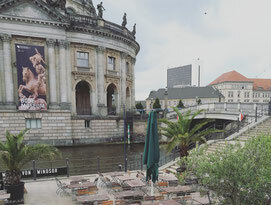 In this article we are exploring the parks of Berlin, accompanied by tips how to order great food from Deliveroo restaurants in the park. Have it all to yourself or to share with your favorite people. To add to the perfect summer experience, we designed a collection of walks that will lead you from spot to spot for an exciting day of picnicking. These parks will wow you with their picnic options. I also organize a picnic on the 4th of July, come by and join us! Resembling a palace garden, Körnerpark is often used for free concerts and performances during summer weekends. If you want to have a picnic in this park, you can order to the following delivery address: Schierker Straße 8, 12051 Berlin. Sahara Imbiss is one restaurant, which is delivering in the Körnerpark, it serves one of the best Falafel in Berlin – authentic and extremely delicious! 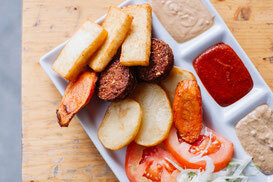 I highly recommend the falafel topped with halloumi and a fantastic tahini sauce. This park was once one of the world‘s busiest transport hubs. In 2008, it became a community park, where barbecues, sports and other social events are held around the twin runways. 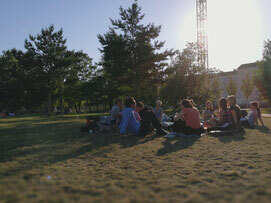 If you want to have a picnic in this park, you can order to the following delivery address: Oderstraße 39 12099 Berlin. 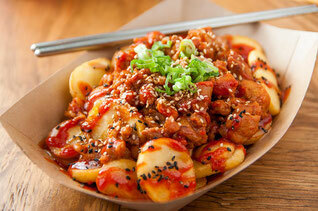 To this park you can for example order some Korean BBQ from Mmaah, I personally love the Bulgogi and Mandu. Where the park now is used to stand the rococo Monbijou Palace. It was demolished in 1959 and replaced with a recreational park. You love poke bowls? Or you have always wanted to try them? In that case, Ma‘loa Poke Bowl will be the place to go for you. Hawaiian feeling all inclusive. If you want to have a picnic in Monbijoupark, you can order at here. The delivery address is Oranienburger Straße 18–19, 10178 Berlin. The area became a wasteland at the end of WWII, and developed a rich diversity of vegetation almost unnoticed. 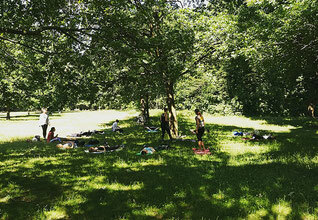 If you want to have a picnic in this park, you can order to the following delivery address: Möckernstraße 43, 10963 Berlin. I love sushi, so I recommend to order some from Stick’n’Sushi. Serving sushi and Danish style Yakitori this mix of culinary cultures have proven to be an award–winning combination. The park is the place where the German gymnastic movement begun. The name of the park goes back to the use of the area as a rabbit enclosure and a place for hunting. If you want to have a picnic in this park, you have to use this delivery address: Hasenheide 81, 10967 Berlin. Sometime a burger is the only answer to hunger. If you want to have a picnic at Hasenheide you can order at Berlinburger International. They started with an old school hippie bus in 2010. Until now BBI thrills us with innovative and down–to–earth burgers topped with ingredients such as fid mustard, red wine shallots or caramelized almond chips.